Vanessa Gamble, Janet Hanson, Dustin Bronson and Jeremiah Gamble in Kingdom Undone. 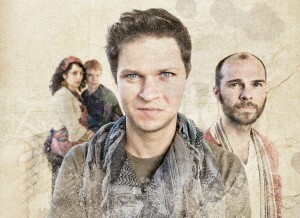 Kingdom Undone (Southern Theater, through April 8, 2012) tells the story of the passion of Christ. Ostensibly looking to celebrate Passover, Jesus makes his entrance into a Jerusalem awash in revolutionary fervor. Zealots appear quite willing to employ terrorism in their efforts to expel the Roman occupiers who are (understandably) nervous and quick to perceive and repress resistance. Jesus and his jumpy followers locate a small room where they celebrate their final supper together. Jesus prays, and agonizes, at Gethsemane. Then Judas Iscariot, acting on his (possibly mistaken) perception that this is what Jesus wants, leads soldiers to Jesus who is, as per the gospels, arrested, tried, flogged and viciously executed. Kingdom Undone ends with the glory of Jesus’s rising. Playwright Jeremiah Gamble (who plays Jesus and has composed, along with his wife Vanessa Gamble, the lovely music) has created a remarkably intelligent, if overlong, play based on this familiar material. Gamble walks a delicate line on the question of Jesus’s divinity: his followers have no doubts – “He is the Messiah!” – but Jesus himself isn’t so sure. Gamble deals forthrightly with the question of Jesus’s motivation: does he deliberately put himself forward as a martyr? Is he suicidal? Is Judas correct when he perceives that Jesus wants to be arrested? Indeed, the rehabilitation of Iscariot’s reputation is one of the real achievements of Kingdom Undone. Still, the essentially religious import of the play cannot be denied. Is the gospel of Jesus a central part of your life? If so, the play will reinforce your beliefs. There is the caress of the familiar: Ah yes, you will say to yourself, this is the story I have come to revere. There are some interesting twists, but nothing designed to jar me into a new understanding of Jesus’s suffering. And if your life doesn’t revolve around the gospel of Jesus, well, you will discover nothing to inspire new belief. But you will see a first rate production. It is a tribute to Gamble’s prowess as a playwright that so many of the characters fascinate. The excellent Kurt Schweickhardt thrills in his multiple roles; he’s simultaneously brittle and powerful. Arnie Roos is both goofy and ghostly as the recently resurrected Lazarus. Vanessa Gamble turns eroticism into spiritual fervor in her very compelling take on Mary Magdalene (though it took me a while to understand that she wouldn’t be bringing out any Spanish finger-cymbals). As Judas, Dustin Bronson is tall, passionate and haunted; he, very admirably, drives the play. Gamble underplays Jesus, a nice counterpoint to the passion of Jesus’s followers. He – rarely – makes Jesus smug and smarmy, an achievement. Everyone’s work, under the taut direction of Jeffrey S. Miller, is excellent. Miller uses the Southern stage (the best, imo, playing space in the area) beautifully and music director Michael Pearce Donley oversees a terrific ensemble. Costume designer Nadine Grant uses contemporary pieces – leather jackets, camouflage pants, etc – and turns them into effective biblical period pieces. Set designer Jeremy Barnett creates lovely hangings and everything is beautifully lit by Geoff Wold. Kingdom Undone has a top ticket price of $25 and, given the size of the production and the talent involved, it’s a bargain. For Christians, the play is a must-see. For non (or less fervent) believers, I’m not so sure. It’s worth mentioning that the Gambles operate a remarkably long-lived and successful group, the Theater For The Thirsty. For more information about John Olive, please visit his website. This production is superbly done, with top-shelf talent both on the stage and behind the scenes. It also takes risks: there is humor; Judas is not a one-dimensional, traitorous assassin; the disciples are fully-human, with lovable flaws and foibles. And most importantly, Jesus is portrayed as the kind of guy you’d actually want to hang out with, rather than an insufferable, overly-righteous, pontificating bore that you’d probably help execute yourself just to send him offstage. The Son of Man is not an easy role to render or portray. But this version of Jesus is likable. This Jesus is fully human, yet divine. I believe this particular rendition of (a portion of) Jesus Christ’s life has the potential to be a seasonal blockbuster, drawing large crowds every Lenten season. 1) The length is excruciating. I’m fairly sure that at intermission, the audience had seen over an hour and a-half of theater. 2) The story is laced with humor. Most of it was character-driven humor, but there was plenty of the laughs that were, frankly, aimed at audience members who will guffaw loudly at what are tantamount to inside jokes: ie: if you attend a regular Bible study group, you will laugh; if you do not, you won’t. Unfortunately, once Jesus enters Gethsemane, the humor is effectively expunged from nearly all of the remaining action. I know, I know: Gethsemane and the Crucifixion aren’t situation-comedy scenarios. Yes, Jesus is suffering. Yes, he is carrying the sins of mankind on his shoulders. But doesn’t he also knows this is temporary? Doesn’t he know there is a method to this apparent madness, that he’ll be back, in better form, in three days? Sure, we are shown characters who have seen the risen Christ. But we, as an audience, never do see him. And, frankly, isn’t that kind of “the point” of this story? Redemption? Excuse me for referencing “South Park”, but suffering without redemption is more like watching a spiritual snuff film than participating in a dramatized spiritual journey. If we must endure a crucifixion scene, than I think we are owed a post-resurrection scene including the same character that we experienced suffering previously. If I remember correctly, according to the Bible, the resurrected Jesus has some encounters with both strangers and his followers. These moments are not only potentially redemptive, but also potentially comical. I’m pretty sure that Jesus is not immediately recognized in most (or perhaps) all of these initial encounters. These scenes needn’t be akin to drawing room, restoration comedy; but they could be inter-personally tender, spiritually gratifying, and humorous: a gratifying return to the tone which disappeared from the script once Jesus is condemned. 4) Once Jesus and Judas are dead, the show continues, but the “life” (excuse the pun) drops out of the plot from that point onward. Without a resurrection, is there really a purpose in continuing? I think it is legitimate to end the story quickly after their deaths; but this play continues on, for what feels like an eternity (although my friend pointed out to me that this denouement “eternity” was probably around 15 minutes). 5) The posters, websites, and programs all show Judas as the central character, with Jesus to his side. While I do appreciate, very much, a three-dimensional rendition of Judas, I must say that as a non-believer, I do feel misled. While this production is very creative and, thankfully, humanizes characters which all too often are wooden or, frankly, inhuman; I need to say that just because Judas is in the center of the story, doesn’t mean that this show’s target audience is a wide (ie: “secular”) one. This version of Jesus’ life has the potential to be an annual blockbuster. But it is clearly written and produced for Christians, and perhaps, arguably, a fairly predictable portion of Christians. (If you look through the program and note the institutions advertising there, you’ll quickly gather who their intended audience is). As a non-believer, I longed for the character of Thomas, the doubter, the one who needed physical confirmation. To be honest, if my friend hadn’t been with me, I would have left at intermission. But for those of you who describe yourselves as evangelical Christians, this is a far superior production of this topic than you are going to encounter anywhere, for a long, long time. I do hope the writers/producers consider making some significant cuts and ending the play with a more flagrantly redemptive scene.